One Marvel fan believes that the Avengers may borrow a Universe-hopping solution from Rick and Morty in Endgame. Posted by user u/DrWaffle1848 on Reddit’s r/MarvelStudios, it says that Earth’s Mightiest Heroes may bring down Josh Brolin’s Thanos by relocating to an alternate universe. 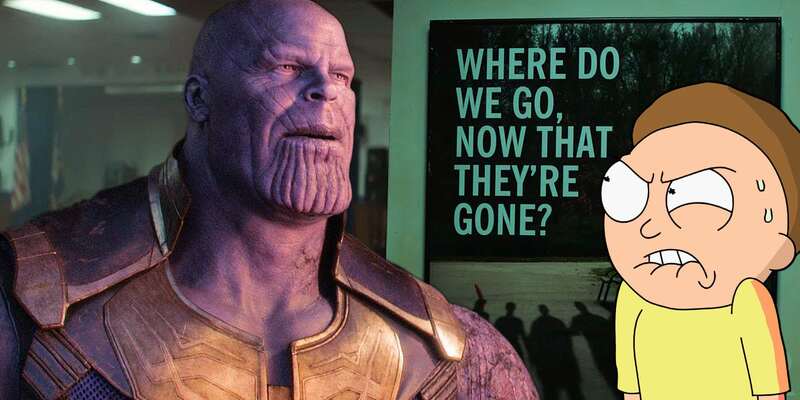 This is where their counterparts died during the Decimation, which is the term used for Thanos’ eradication of half the universe. The theory argues Avengers leaving their planet in favour of a mirror would help to bring those snapped back to life, making the casualties seen in the ending of Infinity War “practically permanent”. This way, the surviving heroes will team up with Black Panther, Spider-Man, and others whose counterparts remain dusted in the MCU. This new counter-reality would be full of mixtures of originals and alternate versions of heroes like Star-Lord and Doctor Strange. What happens in Rick and Morty? In Rick and Morty, we see Morty and his mad scientist grandad Rick bring on the world’s end after a love serum meant to woo schoolmate results in the whole human populace developing into mutates known as “Cronenberg’s”. The duo then travels to one of the many realities where the Cronenberg disaster was averted, but that Earth’s Rick and Morty die soon in an explosion. Rick and Morty coming from a world destroyed by monsters assume the places of their dead counterparts and assimilate into this Earth. However, this wouldn’t avenge the death of those who died. It would go against what Cap says in Endgame Super Bowl spot: “Some people move on, but not us. Even Infinity War co-writer Christopher Markus also claimed all deaths were real, revealing this to BuzzFeed.